Basement Damp Proofing System, Knightsbridge. Following and inquiry by an upset client an appointment was arranged for a Tapco HomeDry qualified damp proofing and timber surveyor to attend the property to inspect a failed Basement Damp Proofing system that had been installed by another contractor. Some of the dry lining material had been removed to enable a thorough inspection to be carried out, which revealed serious faults in the quality of the installation. It was found that joints were open and fixing plugs were leaking which was allowing water to enter the rooms. A thorough inspection was carried out and our report and recommendations were submitted to our client. It was decided that the whole of the dry lining and membrane system be removed and replaced with a completely new, sound system. 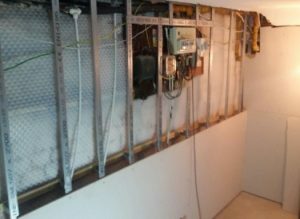 On our clients instructions, our operatives attended the property and immediately removed the existing wall and floor materials and carefully disposed of them. The walls were fully prepared and a complete, new horizontal, polyethylene, studded Cavity Drain Membrane (CDM) system was installed, correctly overlapped and joined by special joint tape and waterproof fixing plugs. A new pump was installed into the existing sump chamber and a larger studded membrane was laid across the floors and connected to the wall membranes. New tongue and groove chipboard was laid throughout, a galvanised wall frame was installed and plaster board lining was fitted and plastered to a smooth finish to create dry, warm rooms for many years to come. The new Cavity Drain Membrane Damp Proofing system is covered by our established 20 Year Guarantee and protected by Guarantee Protection Insurance (GPI). Installing these should only be carried out by a reputable specialist like Tapco HomeDry who are members of the Basement Waterproofing Association (BWA), the Property Care Association (PCA) and Trust Mark (Government Endorsed Standards) so do it right, do it once and call us first.